It’s no secret that basically everyone in the wedding industry is quivering with excitement about the upcoming royal wedding between Prince Harry and Megan Markle, especially since she’s going to be the first American princess. We’ve been watching the news since they were engaged in November 2017 and can’t wait to see the images from their wedding which will no doubt be amazingly stylish. 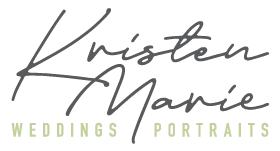 My partner Vanessa (of Storybook Weddings & Events) and I were inspired to recreate that luxurious romance in a royal wedding styled shoot with a modern twist. 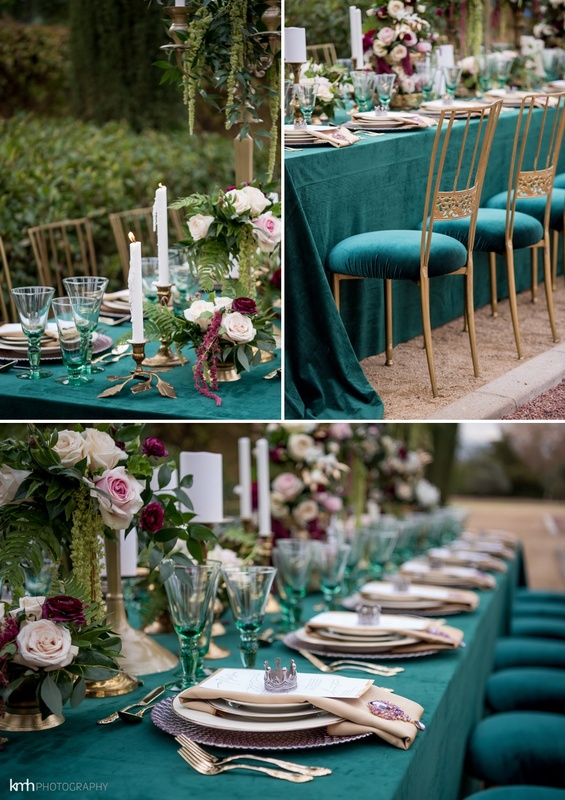 We chose jewel tones of emerald green, deep purple, navy blue and magenta with gold accents to showcase the bold, richness that speaks of royalty. The location for the shoot was Green Valley Ranch Resort, a luxe property off-the-Strip that features an amazing staircase, lush greenery and a pathway surrounded by rows of juniper tress. Our floral and decor designer Flourish crafted a glamorous long tablescape featuring emerald velvet linens from La Tavola, gold candelabras, blush and magenta florals, rentals from Epic Event Rentals and hand-lettered menus from calligrapher EGletters. The day started out with a Vegas anomaly of pouring rain and cold temperatures! We waited out the storms, dried off our decor and were left with a overcast sky and dewey look – perfect to recreate that sense of England. Our princess donned a super couture, ultra modern Christopher Paunil gown from Grey Peal Bridal Gallery. Amelia C & Co kept her look classic, chic and clean (just like Megan herself) with natural makeup, an up-do and a crown from RomanticARTLife. Her bouquet was a simple white piece created to resemble the classic white bouquets of royal weddings, including Kate’s understated lily-of-the-valley bouquet. Our prince looked dapper in a wine colored tuxedo from Tuxedo Junction – a modern twist on the traditional black tie look. The royal newlyweds posed by the ceremony site at the property’s grand staircase and also kissed on the balcony, a classic must-have royal wedding shot as the couple is introduced to the adoring public. This royal-imagined wedding was truly epic and I couldn’t have been happier with the results!  Our amazing team of creatives really came together to craft modern, glamorous and luxurious photoshoot that delves into the world of the royalty. I’m proper chuffed to see the actual royal wedding which I’m sure will be ace. (Alright, I know I’m American but you can’t blame me for being excited!) Cheers, mates. Drop dead, out of this world, totally and completely gorgeous! Some days I can’t even believe I get to live this life and do this thing with such amazing creative peers! Thanks for letting us be part of this absolutely stunning shoot!! Haha! I know how you feel Amelia – I feel the same! Thank you for your kindness and your incredible team and their talent! Stunning! The colors are gorgeous and every photo is better than the last. So beautiful. You are the sweetest Tracey! Thanks!